The Aqua-M50D is applied in the water supply business to pre-locate (testrod) leaks. Due to its handy size, this measuring instrument is especially well suited to listen to water meters. The Aqua M50 is supplied with a number os attachments for getting into small tight spaces. 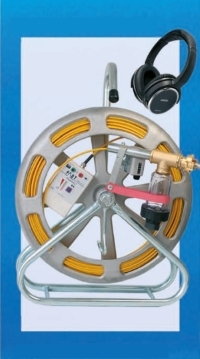 The Aqua-M200D is used in the water supply business to pre-locate (testrod) and to calibrate leakages (geophone). In combination with the Pulse Wave Generator (PWG), it can also be applied to trace the run of a pipeline. The testrod has been specially developed and features an extremely high sensitivity. It has been designed to detect even minute leakages. The variable testrod is perfectly well suited to listen to water meters and to systematically check pipeline network sections. The sheltered ground pick-up is capable of pinpointing leakages. The tripod can be mounted on a magnet thus enabling the operator to carry out measurements on soft ground. The Aqua M300 facilitiates the pinpointing of leaks both acoustically and using tracer gas. This system combines both to allow the user to trace even the smallest of leaks while also allowing long term measurements. With the acoustic pig (PipeMic) developed by F.A.S.T., leaks on plastic connections/pipes can be located easily due to a special lock which allows the probe to be pushed into the pipe with high pressure (up to 16 bar). As the length and the exact position of the inserted glass fibre can be determined, the leakage spot can be determined with utmost precision. With the Gas-Check-H2 even tiny little leakages can be pinpointed. Hydrogen diffuses through almost any material due to its molecular size. The pipeline section to be checked is filled entirely with gas, and the pressure is increased slowly until the measurement varies according to the size of the leakage, the kind of soil, and the surface structure.